I have a *MUST HAVE* book to share with you! If you are thinking of becoming pregnant or are currently pregnant than you need to run to the store (or if your like me go to Amazon) and get a copy of Eating Expectantly by Bridget Swinney, MS, RD. - How to have a healthier lifestyle and diet before conception to improve fertility and the odds of delivering a healthy baby--including advice for women with PCOS. - Step-by-step advice for each trimester--including power nutrients and super foods. - How to gain just the right amount of weight with the "smart carbs" approach. - How to eat "cleaner" and "greener" by limiting pesticides and other chemicals. - Diet and lifestyle tips to prevent high-risk conditions like gestational diabetes, hypertension, pre-eclampsia and preterm birth. - Contributions from other RD experts: Dave Grotto, Tammie Lakatos Shames, Connie Evers, Angela Grassi, Diane Welland, Dr. Jo Lichten, Sharon Palmer, Judy Simon and Tamara Duker Freuman. I wish I had this book sooner! Seriously the wealth of information from thinking about pregnancy to bringing home baby is amazing. Yes, it is about food but it is about so much more. I started the book with the third trimester and it was right on cue for me. It went through gestational diabetes (something I'm being tested for next week) as well as heartburn and what your meals should look like! After that I flipped through the rest of the book and I was just amazed at all that is included. This is a modern approach to diet by going through the whole pregnancy from pre-conception to birth. Tips, tricks and advice are littered through out the pages. It will be the gift I give for expecting moms! You can purchase your copy of Eating Expectantly at your local book retailer or online at stores like Amazon! 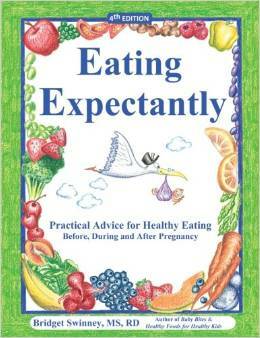 One lucky reader will win a copy of Eating Expectantly! I'm not expecting but this would be great for my high school daughter to read as part of her HE course. There are so many books that I wish I would have read before having my babies. I don't know if it's the Lords will for my dd to have kiddos but if she does I want her to have read books like this one. I am not currently expecting but my sister is. I would love to win this helpful and interesting book for her. I'm not expecting that I know of but we're praying! I am expecting! I am due January 17 with our first little girl!